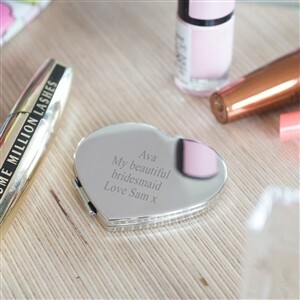 This sweet heart shaped compact mirror is a perfect present for your bridesmaids, mum or best friend! The lid of the compact can be personalised with any message you like, we can engrave over 5 lines with a maximum of 75 characters in total. Maybe a snipped from a favourite song, a special occasion or a birth date - the choice is yours! The mirror has a gorgeous smooth, polished finish and is the perfect size for a small clutch bag. As a lovely, finishing touch your mirror is sent inside our signature grey gift box hand tied with grosgrain ribbon. If you're sending direct to the recipient, we can pop your gift in a gorgeous quality gift bag with hand written gift tag. Just add our gift bag at the top.